The Creative Hands Mission: To take a vision created by the client and create a one of kind culinary concert containing elements of great food and service to produce a theatrical and memorable experience for their guests. If the old adage of “you are what you eat” is true. It would be best to eat only gourmet, fresh, local and sustainable food whenever possible. Creative Hands Cuisine strives to deliver all of those elements whenever possible. Healthy food makes healthy clients! Creative Hands Cuisine is a close knit group of people in and out of work. Our team takes tremendous pride in pleasing clients. It’s always our goal to exceed what’s expected of us. Many have worked with us for over 10 years and continue to elevate their level of skills and performances with us. What all that means for the client is great consistency and fluidity of execution of events. No temporary workers rather seasoned and superbly trained staff. We boast about our chefs who not only are masters at culinary creations but who are also well manicured and well versed and actually interact with and enjoy educating guests. To actually have a uniformed chef approach your table to ask how your meal was is a common occurrence rather than an isolated one at Creative Hands Cuisine. 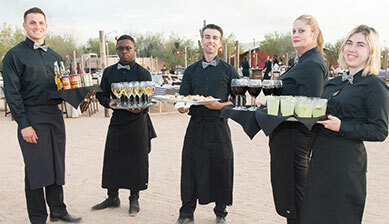 Wait staff and Bartenders are all extensively trained for success. Guided by our operations team of experts all service staff receives training in logistics of different styles of service from plated to stationed to buffets. Etiquette training is another key component to what makes our wait staff superior to others in addressing clients and presenting cuisine and beverages.